New Delhi, April 9: The then Union Home Minister Mufti Mohammad Sayeed had wanted the controversial 'rath yatra' of L.K. Advani in 1990 to "go on", says a book authored by Bihar Chief Minister Lalu Prasad who had arrested the BJP leader to scuttle his programme. In his autobiography titled "Gopalganj to Raisina: My Political Journey", which was made available from Sunday, Lalu Prasad narrates how he was called to Delhi to discuss the issue related to the yatra. "To be honest, nobody had asked me to stop the procession or arrest Advani. The Prime Minister (V.P. Singh) had said nothing. Mufti Mohammad Sayeed, who was then the Union Minister for Home Affairs, called me to Delhi and enquired if I planned to detain Advani," he has written. "Sayeed told me 'why are you taking upon yourself (to block the procession)? Let the yatra go on'," he added. The Rashtriya Janata Dal (RJD) chief, who was then in the Janata Dal, however, said he retorted by saying: "Aap sab ko satta ka nasha chad gaya hai (all of you are intoxicated by power)." "I felt that by arresting him I had haled the demolition of the Babri mosque, which could well have happened in 1990 itself. 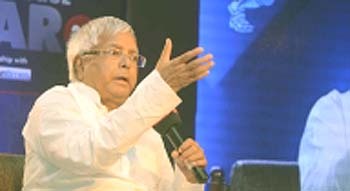 I was at peace with myself over the realisation that I had done the right thing," Lalu Prasad said.